Tonight we start with a bit of history discussing the one key event which allowed Adolf Hitler to become the absolute dictator of Germany in 1933. It was a piece of legislation called The Enabling Act. The Enabling Act allowed the cabinet to enact legislation, including laws deviating from or altering the constitution, without the consent of the Reichstag. Of course as soon as The Enabling Act was passed, Reichstag effectively gave up all its powers. Wikipedia: - The Act effectively eliminated the Reichstag as active players in German politics. While its existence was protected by the Enabling Act, for all intents and purposes it reduced the Reichstag to a mere stage for Hitler's speeches. It only met sporadically until the end of World War II, held no debates and enacted only a few laws. Within three months after the passage of the Enabling Act, all parties except the Nazi Party were banned or pressured into dissolving themselves, followed on 14 July by a law that made the Nazi Party the only legally permitted party in the country. We've come to ask for decree powers that will give us a solid legal basis to act quickly and firmly against this badness, this sickness… If corruption continues and perpetuates the destructive logic of capitalism, there won't be socialism here anymore ... Corruption must stop being a normal part of our political life … It's the same gangsterism, however it's dressed up. Of course any opposition is also corrupt and needs to be removed. Sounds familiar? In the case of of Venezuela one starts by hitting hard against those capitalist pigs, confiscating their businesses and forcing them to give away merchandise. USA Today: - Thousands of Venezuelans lined up outside the country's equivalent of Best Buy, a chain of electronics stores known as Daka, hoping for a bargain after the socialist government forced the company to charge customers "fair" prices. Cheap Sony plasma TVs for the masses! Before fighting more evil however, one needs to raise some money - and Venezuela's government is trying to do just that. The state owned oil and gas conglomerate PdVsa (which is effectively a branch of the government) will raise $4.5bn in bonds (with a mid-teen type coupon). The central bank will be the initial buyer, who will then try to resell to private investors (see story). Now imagine if things get even tougher for Venezuela (foreign reserves are already at 9-year lows and the economy is in shambles - see post), how long would it take Maduro to use his Enabling Law to stop payments on these and other bonds? Hitler did it in 1933, as Germany unilaterally ceased payments on all long-term bonds. And this new law to make Maduro the undisputed dictator of Venezuela now looks likely to pass - in some ways repeating the dark chapter from 80 years ago. GS: - The [bond issuance] announcement comes at a time when the market is under pressure due to recent economic announcements signaling an increase in government intervention and events last weekend related to the seizure of some electronic retailers. 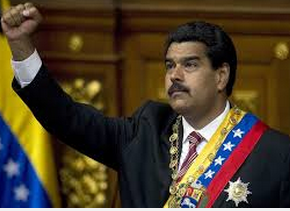 Moreover, the perceived radicalization in economic policy could firm after the passage of the Enabling Law, which would allow President Nicolas Maduro to bypass the National Assembly. The Assembly has moved one step forward towards the approval of this law with the expulsion and stripping of parliamentary immunity of Deputy Maria Aranguren, who opposed the passage of the law. Ms. Aranguren, elected as a member of the official United Socialist Party of Venezuela (PSUV) but later siding with the opposition, is under investigation on embezzlement charges. She will be replaced by Carlos Flores, who is expected to support the initiative, providing the government with the last vote needed to reach the necessary majority for the passage of the law. As a consequence, the Enabling Law could be approved in the coming days.